Mirror, mirror on the wall, what's my favorite movie of all? According to my mom, the first movie I saw in a movie theater was Snow White and the Seven Dwarfs. I don't really remember that experience, but I do know that I have always liked Snow White. 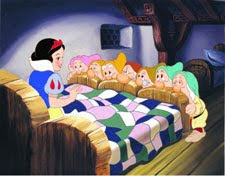 The scene where Snow White cleans the dwarfs' house with the animals help always makes me smile. And the dwarfs - Doc, Sneezy, Grumpy, Happy, Bashful, Sleepy and Dopey - they're just so loveable. I can hardly believe that Snow White, the first full-length animated film produced in the US, has been around since 1937! And now it's making history again. Today, Oct. 6th, Disney launches it's all new "Diamond Collection" products with the release of Snow White and the Seven Dwarfs Diamond Edition Combo Pack (both Blu-ray + standard DVD discs in a single package). The Blu-ray format offers a high-definition viewing experience wth amazing pictures and sound, games, and other activities on a more scratch resistant and kid-proof disc. 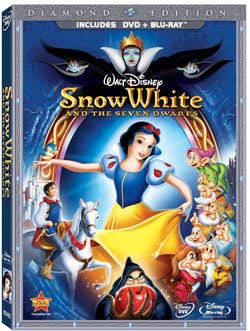 Even though we don't own a Blu-ray player, we received a Snow White Combo Pack to review. This combo pack is a great value because it offers buyers both the standard DVD format and Blu-ray together in one package. For those that own Blu-ray players, the inclusion of a standard DVD will allow them to watch their movie other places like car DVD players. And the combo pack offers flexibility for those of us that don't own a Blu-ray player yet but plan to buy one in the future. (Blu-ray players play both Blu-ray discs and standard DVDs). Since we don't own a Blu-ray player I can't comment on the Blu-ray extras, but we watched and enjoyed the standard DVD. The bonus features on the regular DVD include The Princess and the Frog Sneak Peak, the song "Someday My Prince will Come" sung by Tiffany Thornton, and the option of Audio Commentary with Walt Disney. For those absolutely not interested in Blu-ray, the Deluxe 2-Disc Classic standard definition DVD of Snow White releases Nov. 24. The Disney website features a fun flash site Explore the Kingdom game. My daughter and I had fun finding the 15 Diamonds to gain entrance to the Dwarfs' Mine. With this re-release, I bet Snow White will be a popular princess costume for Halloween. About 6 years ago I dressed up as Snow White for Halloween. See my picture to the right! My mom made the costume. Do you think I make a good Snow White? $10 off printable Bricks coupon (Firefox version) or (Internet Explorer version) Expires soon, print immediately (via Steals and Deals). I also saw on Thrify Jinxy that today only on Amazon get $10 off the price by using the code SNOWHITE.